Origami Paper → Double-Sided Origami Paper → Double Sided Origami Paper Kit with FREE Instructions - MIXED COLORS 6"
The Double Sided Origami Paper Kit contains 36 sheets of high-contrasting, double-sided origami paper. The brightly colored origami paper features contrasting colors on each side and is 15 cm square. Great Beginner Origami Paper Kit! This paper pack contains 36 sheets of high-contrasting, double-sided origami paper. 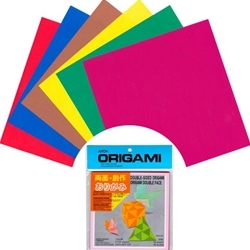 Each paper in the Double-Sided Origami paper Kit provides bright, vibrant colors for your origami sculpture. The double-sided paper is perfect for foldings of geometric patterns and shapes and any project requiring contrasting colors. For a little variety, mix this origami pack with our Double Sided Polka Dot Kit and the possibilities are endless!